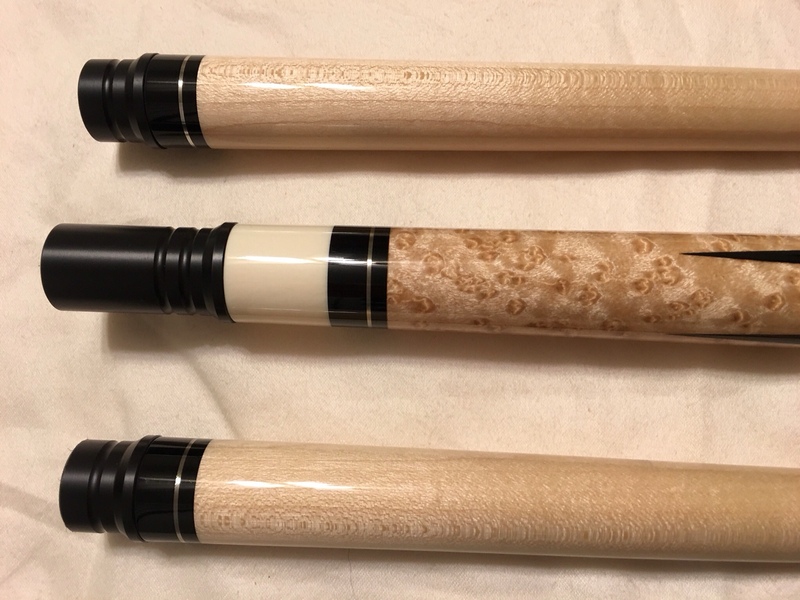 I've been working on my picture taking and thought I would post the latest pictures of my cues. The one in the middle is obviously the JM W and the Ebony and Amboyna is Denali and the six-point is Larry Vigus. Thanks for the awesome compliment but I let it go once and don't plan to make that mistake again! I am so glad you got the JMW back, Zack. 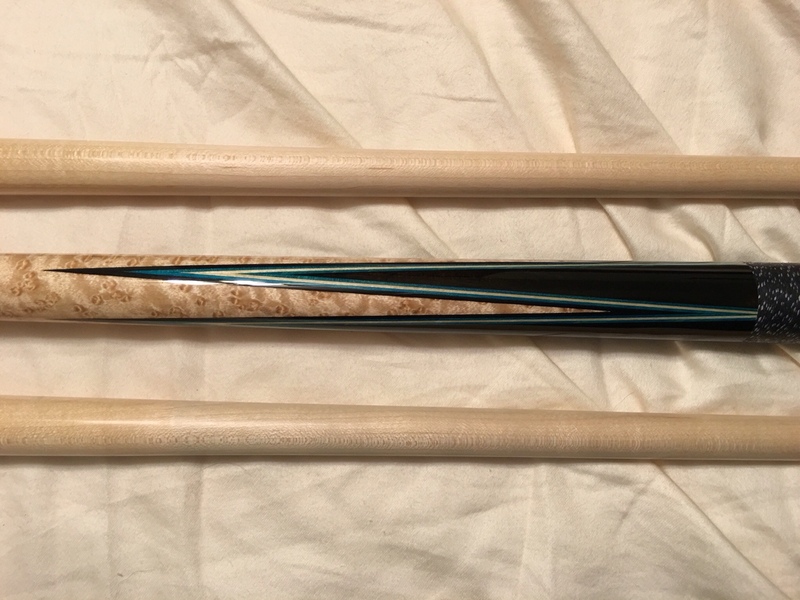 All three are great looking cues. Can you describe how each one plays? I'm glad I was able to get the cue back as well! I got super lucky that it was Steve who won the raffle! As for how each plays, I'll have to put them through their paces at league this week as I'm not great at discerning the differences. That said, I can definitely jump balls better with the JMW than any other full cue I've used. I don't know what it is but if it's only a partial ball I have complete confidence and it clears wi ease. Steve is a class act. Steve is a class act indeed. I am fully aware that we both won the raffle as had it been most anyone else I would have never gotten it back! Here are some crappy cell phone pictures of the Blackcreek I just bought. It's 59" instead of 60" but I had really been Jonesing for a veneered full splice cue and decided it was close enough. 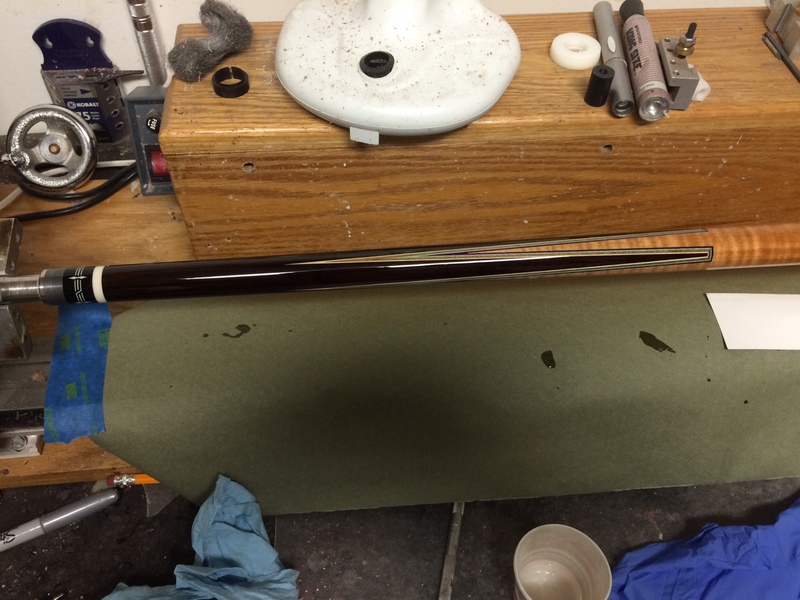 I was also fortunate enough to snag one of Larry Vigus' bridged veneer full splice cues that should be ready in a couple months! Yeah, I'm pretty impressed with the fit and finish. The only thing that will be interesting is if the linen wrap will bother me. Any word on who to send it to if I decide I need to go leather? Here's one in progress. I am very appreciative that I was able to get in on this cue, thanks Larry! East Indian rosewood and dark curly maple. 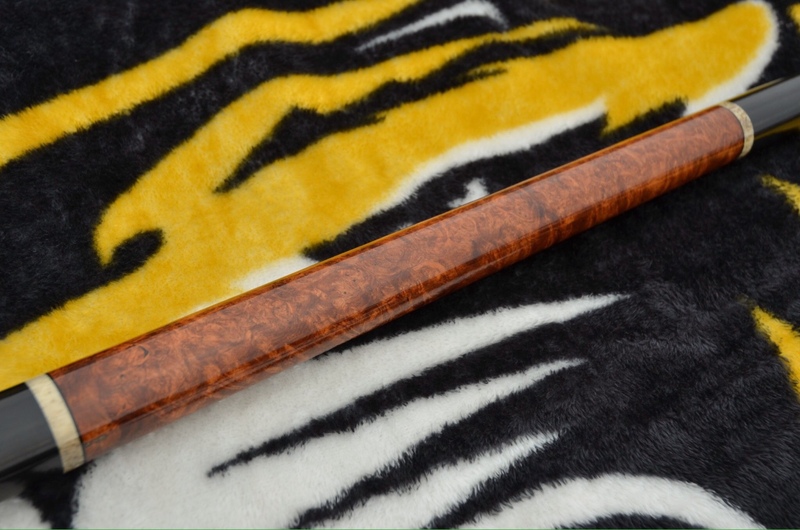 The background blanket (tiger) on the original cue pics is very distracting. Those north Tejas cue makers are killin' it!!! I agree sometimes quick and dirty pics turn out well and I know I need a different background! The Mizzou blanket is what I had handy at the time. Indeed! I can't wait to get this beauty as I'm thinking this will be my everyday player.